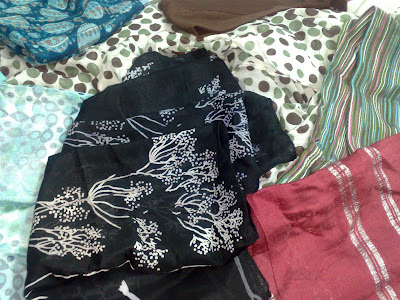 6 hijabs and a couple of under-scarfs. I could totally have bought 20, but I was trying to restrain myself. There are SO many to chose from! There was on shop who had 2 for 1 at 45Le, so I got 2 there and I actually bought the one on the far left specifically to match the ring I bought below. I finally found the rose ring I was looking for at Claire's but they only had this turquoise one, which was fine but I wanted black. It was the last one on clearance. 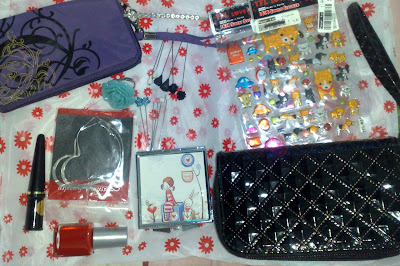 Other stuff starting on the left, going clockwise, Eyeliner/Kohl, Heart/hoop earrings, a phone case/bag thingy, a rhinestone hair pin, below that, assorted hijab pins, stickers, a new wallet. I love it because it has a place for your keys, phone, money and id. All you need sometimes and all in a handy wristlet. Left of that is a cute mirror compact and red nail polish. Click the image to see the hijab pins better, I love them! I have a black rose ring w/some bling! lol...I'll send you a pic. I sell AVON on the side so I got it from their MARK line. I wonder if A) you have AVON there and B) if you have the same/similar stuff as we do here. loooooooove the ring!! and love the colour of it!! it's so u!! did u ever end up getting that eyeliner that u ordered from that girl? i LOVE how reading your blog makes me wanna go shopping, mona. hehehehe. Amalia, Cool. I love the fabric of it! bzmomma, Cool. Yea we have Avon here but we don't have all the jewelery, bags, clothes and not nearly as many products. A friend used to sell it. I love the nailwear polish and this olive oil hair mask. Jujey, Thanks, I'll get it when I see her I suppose. Kit, Thanks...Small purchases fill the void just as well! Cute! What is that thing with the girl and bunny? My Getaway, it's a mirror/compact. I love the picture, It's so adorable. Isn't it nice to do some shopping :)? !You found such nice things.I looove the mirror and it makes me think that I've to buy a new one.